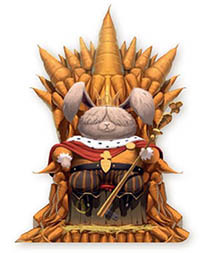 Every Choice Can Bring You Laurels Of Victory, But In The End, Only The Most Valiant Among You Will Be Named "big Ears" By The Bunny King. Will You Be Worthy? 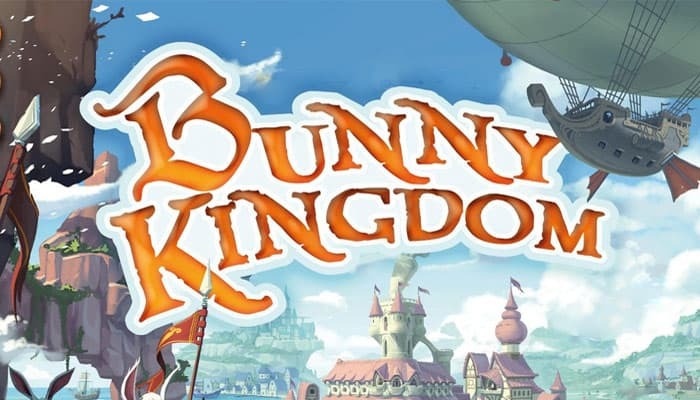 Bunny Kingdom is a drafting and placement game that plays over 4 Rounds. During each Round, players will develop Fiefs, construct Cities, farm new Resources, and receive Parchments. Choose your cards carefully to develop your strategy. 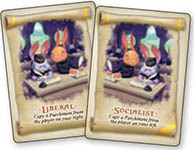 Keep in mind the cards you pass on may help your opponents! At the end of each Round, you harvest Golden Carrots ( ) based on your Fiefs, their Strength, and their Wealth. Parchments will not be revealed until the end of Round 4, and will definitely disrupt what appeared to be set in stone! After the final scoring, the player with the most wins the game. Place the New World board in the middle of the table. Place one Strength 1 City on each City space on the board. Each player chooses a color, puts the 36 Rabbit figurines of that color in front of them, and places one of their Rabbits on space 0 of the Score Track. Place the remaining Cities and tokens next to the board. Shuffle all the Exploration cards to make a deck and place it face-down next to the New World board. The game is played over four Rounds. Each Round has three phases (EXPLORATION, Construction, and Harvest) that are played simultaneously by all players. After the fourth Round, Parchment cards are revealed and the final are scored. Look at the cards in your Hand and choose 2 that you will play. Put them face-down in front of you. Place the rest of your cards face-down in front of your neighbor (be careful not to mix them with the cards they chose to play!). They will take them after the Play Cards Step. 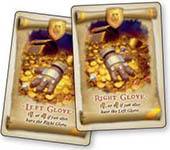 During rounds 1 and 3: pass the cards to the player on your left. During rounds 2 and 4: pass the cards to the player on your right. Play the 2 cards you chose in the first step. If you play a Parchment card , place it face-down in front of you without revealing it. You can look at your Parchment cards at any time. They will be revealed after the 4th Round (at the End of the Game). Note: The number of Parchment cards you have is public information. 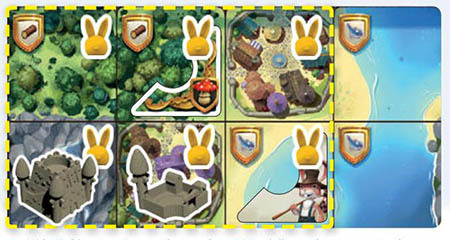 If you play a Territory card , place one of your Rabbits on the Territory shown on your card (it will have the same coordinates). You control this Territory from now on. Put the Territory card in your discard pile. 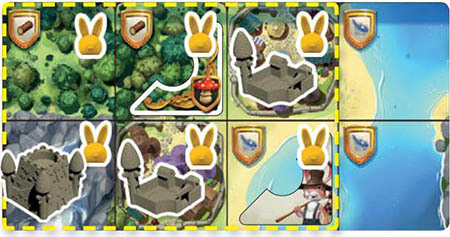 Note: If the Territory is already occupied by an opponent's Camp , remove their Rabbit and the Camp token before placing your own Rabbit. Your opponent loses control of the Territory. If the Territory is occupied by one of your own Camps , remove the Camp token. This Territory can now hold a different Building. 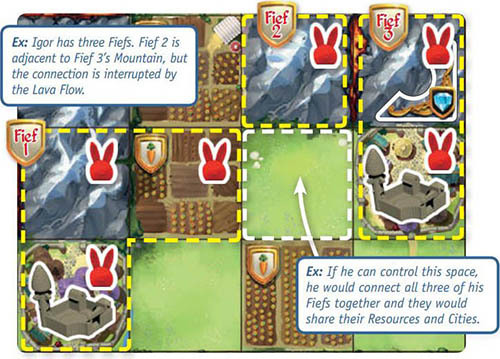 A Fief is a group of connected Territories under one player's control. Territories are connected if they meet on the sides (top, bottom, left, or right- not diagonally ), unless they are separated by a Lava Flow. Fiefs 1 and 2 are not connected since the adjacent Mountains are separated by a Lava Flow. If you play a Building card , place it face-up in front of you and put the City or token shown (farm, Sky Tower, or Camp) on it. You can place your Buildings on the New World board during the Construction Phase. Buildings let you improve your Fiefs to make them more valuable. After placing a Building, discard the associated card. When you play a Provisions card , immediately draw and play two cards from the deck. Put your Provisions card in your discard pile. You can now look at the cards your neighbor passed to you (if there are any). Repeat these two steps (draft and play) until all the hand cards have been played (for example, a total of five times in a 4-player game). After the last cards are played, begin the Construction Phase. Each round, both players take 10 cards into their hand and place 10 cards face- down in front of them without looking at them. These cards are their Reserves. Each time, before choosing cards to play, draw 1 card from your Reserve and add it to your Hand. Then, instead of choosing 2 cards to play, choose 1 card that you will play and 1 that you will discard (face-down). Pass the other cards to your opponent face-down. The Play Cards Step plays normally. Example - Draft Cards: Timothy has the Territory cards A3, G5, A4, H4, and F1, the Parchment cards Fisher, King of Thieves, and Royal Crown, and the Building cards Mushroom Farm and City 2. He chooses Territory card A3 and Building card Mushroom Farm, and places them in front of him, face-down. He passes the other 8 cards to his neighbor. Example - Play Cards: Timothy reveals his two cards: Territory card A3 and Building card Mushroom Farm. . 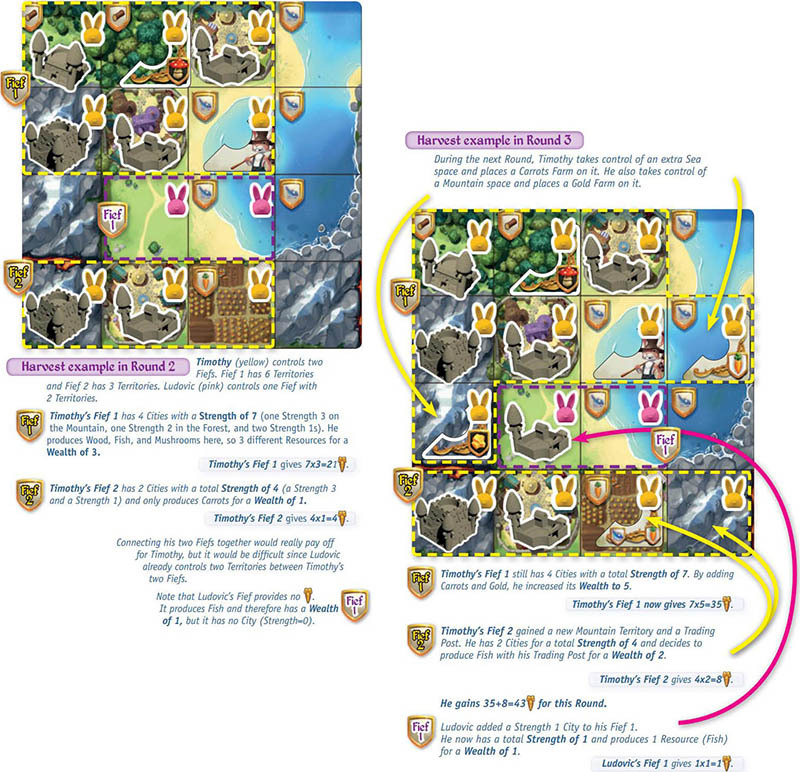 He reveals and discards Territory card A3 and puts one of his Rabbits on the matching Territory of the board, which enlarges his Fief by connecting B3 and A4, which he already controls. He puts his Building card in front of him and puts a Mushroom Farm token on it. 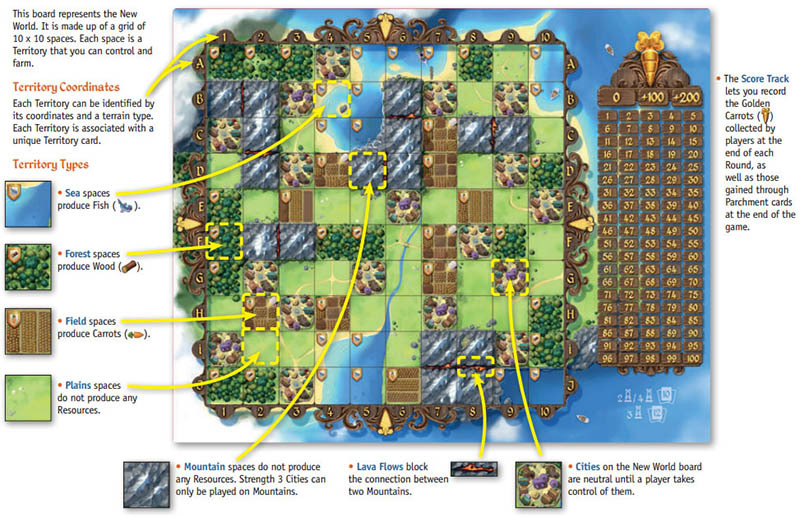 During this phase, you can place your Buildings on the New World board by following the conditions below. Buildings increase the Strength, Wealth, or size of your Fiefs. You are never required to place a Building. You can leave them in front of you to place later. You can only place your Buildings on Territories you control, except for Camps which can only be placed on empty Territories. You must respect any Building Requirements of your Buildings Luxury Resource Farms and Strength 3 Cities can only be placed on certain types of Territories, as indicated by the symbol on the card and the background color of the token. 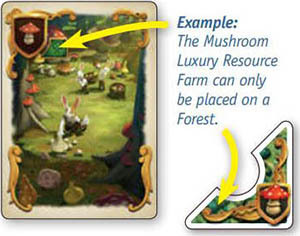 Example: The Mushroom Luxury Resource Farm can only be placed on a token. A Building cannot be moved once it has been placed on the board. There can never be more than Forest. one Building (city or token) on a Territory. If you place a Building on a Territory that already produces a basic Resource it continues to produce that Resource in addition to the effect of the Building. Building example: Timothy adds his Mushroom Farm to the Forest at A3. This Territory now produces Wood and Mushrooms. Strength 1, 2, and 3 Cities increase the Strength of your Fief by 1, 2, or 3 respectively. Farms increase the Wealth of your Fief. Sky Towers connect two of your Territories in different Fiefs as if they were adjacent. These Territories and any Territories that are connected to them are now part of the same Fief. 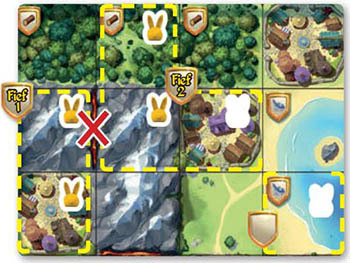 Camps let you take control of any empty Territory (without a Rabbit or a Building) on the board. Each Camp has a priority number (shown on the card). If you want to place a Camp, you must announce its priority number without announcing which Territory you want to play it on. Any player who has a Camp with a lower priority number can interrupt you and play their Camp before you (starting with whoever has the lowest priority number). After they play their Camp (or pass), you can either play yours or pass and save your Camp for a future Round. When you play a Camp, place one of your Rabbits on it to show that you control that Camp. If an opponent plays a Territory card that corresponds to one of your Camps, remove the Camp and replace your Rabbit with one of your opponent's. If you played this card, simply remove the Camp. You may play a new Building on this Territory from now on. Example: Timothy adds a Camp to the Sea. His Fief now has one Strength 1 City and produces Fish. During this phase, players harvest from all their Fiefs. Remember: A Fief is a Territory or group of connected Territories that you control. Territories are connected on their sides (not diagonally). All of the connected Territories in a Fief share their Resources and Cities. Important: A Fief only provides if it has at least one City and one Resource. The strength of a fief is the total of all of the towers in its cities. A strength 1 city has one tower, a strength 2 city has two, and a strength 3 city has three. Ex: This Fief has two Strength 1 Cities and a Strength 3 City. Its Strength is therefore 5 (1+1+3=5). The wealth of a fief is equal to the number of different resources it produces. Ex: This Fief has two Forests that produce 2 Wood (but only one counts when calculating Wealth). One of them has a Mushroom Farm on it, and another Territory is a Sea that produces Fish. 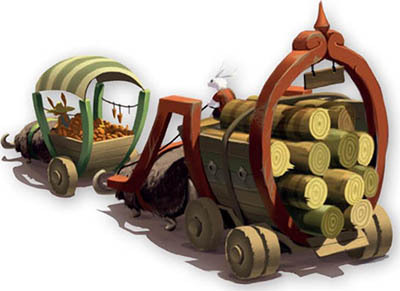 The Fief 's Wealth is therefore 3 (1 for Wood, 1 for Mushroom, and 1 for Fish = 3 different Resources). This Fief gives 15 : 5 (STRENGTH) x3 (WEALTH). Move your Rabbit up on the Score Track for each gained. If you pass 100 , put a second Rabbit on the +100 space. If you pass 200 , move the Rabbit to the +200 space. If you have just finished the 4th Round, it is the End of the Game. All players reveal their Parchment cards and it's time for the final scoring! Once the Harvest Phase is complete, begin a new Round. Deal 10 or 12 new cards to each player, depending on the number of players. At the end of the game, it's time to reveal your Parchments! One at a time, each player reveals their cards and checks to see if they have fulfilled the requirements of their Missions. Treasures automatically give , while gaining through Missions depends on your Territories, Fiefs, Buildings, or even other Parchment cards. For every you gain, move your Rabbit up on the Score Track. The player with the most wins the game and the honorific title of "Big Ears" until the next game! In case of a tie, the tied players share the victory. Several Missions refer to the Resources you produce (for example, the Carpenter gives 1 for each Wood you produce). Unlike Fiefs, these cards actually count "all Resources", even if two or more identical Resources are produced by the same Fief, and including any produced by Farms. Important: At the end of the game, Trading Posts produce the same Resource they produced at the end of Round 4. You cannot choose one Resource while calculating a Fief 's Wealth during the last Round, then choose a different Resource to fulfill a Mission. Reminder: A Territory can produce 2 Resources - a basic one on the board and a second one if you played a Farm on it. Some Missions refer to the number of Cities you control. The Strength is not important: A Strength 1 or 2 City counts the same for this type of scoring. Other Missions refer to the number of Fiefs you have, or the number of Territories that make up a Fief. You cannot choose to ignore Sky Towers or Camps for these Missions. Territories connected by Buildings still make a single Fief. This card refers to all of a player's Territories (Plains and Mountains) that produce no Resources and have no Cities, even if they are part of a Fief that includes Territories that do. You copy the entire card: If you copy a Treasure, it also gives you Bonuses if you have the Treasure Guardian and/or the Treasure Hunter Mission. They give you 1 if you only have one glove or 4 each if you have both gloves (for a total of 8 ). If there is a tie between the Fiefs that give you the most , harvest all but one of them again.